In this video, Kate Hartman talks about the wearable art that she has created. Hartman, who calls herself an artist, educator and technologist, in that order, is a physical computing instructor. She shares with her audience her observations and personal sense of wonder about the ways in which humans communicate with themselves, with others and with the world around them in the context of modern technological advances. Hartman begins her presentation by introducing herself and telling watchers about her credentials and her own work, then challenges her audience to think about why bodies matter. The answer, she tells them, is that everyone has one. Everyone uses their bodies to hear and to make themselves heard. 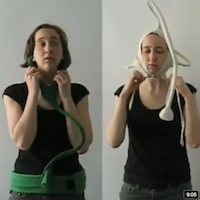 As part of her exploration of the ways in which people use technology to facilitate or block the development of relationships with self, others and the surrounding environment, Hartman has developed a number of technological devices that can be worn. Hartman’s whimsical communication projects include a Hat to Share Your Thoughts that allows wearers to share the cacophony of thoughts that fill the human consciousness, a Talk to Yourself Hat that channels the wearer’s voice back into his or her own ears, a Gut Listener to allow a person to listen to their own insides and the Discommunicator, that allows the intensity of angry words to get through but muffles the individual words that are spoken.